Teen Vogue’s Amy Astley on "Strictly Ballet"
Jasmine Perry with Alec and Victor of "Strictly Ballet"
You already know just how much we love it when the fashion world enters ours (excluding the recent Free People, um, snafu). So it’s no surprise that we’re ecstatic about Teen Vogue’s newest venture: a web series (premiering today!) following six students at the School of American Ballet. Also awesome? The show lets us catch up with Jasmine Perry, who, since making her debut on "Dance212," has shed her braces and continued to develop into an utterly gorgeous dancer. SAB student Emily wears a Rebecca Taylor dress. Dance Spirit: Why did you want to make “Strictly Ballet”? Amy Astley: I’ve been asking myself what I can give back to ballet, since I got so much from it. And I thought that the best thing I can do is promote it. Ballet dancers should get a lot more attention in pop culture than they get. They’re so beautiful! And I find dancers to be insanely grateful. Their humility is refreshing. DS: What did your ballet training teach you that you still use today? DS: What’s your goal for the series? AA: I really hope that people—who aren't necessarily all bunheads—will get engaged with this series. I’ve definitely spent enough time in my life watching movies about baseball, and I don’t know much about that sport. I think ballet should be the same way: It should be fascinating on its own, even to people who don’t know a lot about it. DS: How will “Strictly Ballet” be different from AOL's “city.ballet.” or The CW’s “Breaking Pointe”? AA: I didn’t want a reality show that dug into the super-personal aspects of the dancers' lives. It’s just meant to celebrate the kids as aspiring artists, and highlight their extreme dedication and talent. It’s amazing to be interviewing kids who are 14 and 17 who know exactly what they want to do. (L to R) Victor and Alec of "Strictly Ballet"
DS: As a ballet fan, what has been your favorite part about this process? 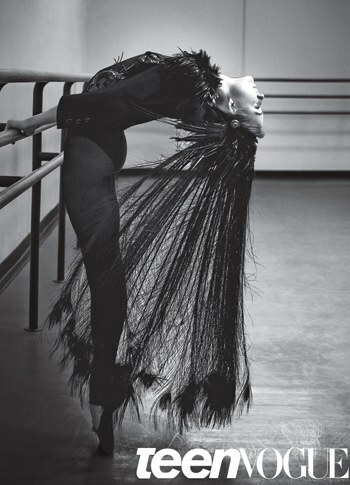 AA: I got to meet Peter Martins, which was such a great thrill since I grew up watching him dance with Suzanne Farrell. Peter Martins was one of my all-time favorite dancers, along with Suzanne, Natalia Makarova, and Baryshnikov, of course. SAB's Mimi wears a Louis Vuitton jacket and headdress in Teen Vogue. DS: In your editor’s note this month, you write that you quit ballet at 18. How did you make that decision? AA: During my summers at CPYB, I saw what the talent was like out there since I was dancing with girls from NYC and SAB. I was in their level, but I was never really as good—I was sort of at the bottom of the top. I didn’t have what it took to be in the companies I wanted to join, and the regional ballet scene wasn’t as strong then as it is now. It was an extremely hard time for me. I had barely even applied to colleges. I did end up going to school back in Michigan, but I can relate to students who aren’t sure if they’re ready for professional life, as well as to those who aren’t sure if they even want it. DS: Knowing what you know now, what would you tell those dancers? AA: Whatever you decide, remember that studying your art has been time well spent. You get so much from those years. And keep dancing if you love it. Whether you’re studying modern, tap, jazz or ballet, the training is great for your brain and your body. You’ll probably grow up to be one of the people supporting the arts and keeping ballet companies alive—I go to the ballet very regularly, to see both NYCB and American Ballet Theatre. I just love it. I never got ballet out of my system.